Thumbing around the world with the Blackberry Tour 9630. The world phone was conceived originally for people so on the go that their connectivity needs transcended continents. While we hear there still are a few of those people out there, the appeal of such mobile devices has expanded to those who spend more of their time eating toast than croissants. 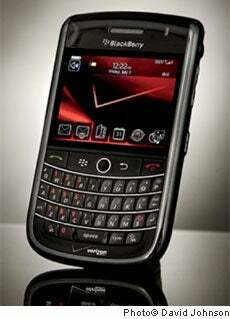 The sleek BlackBerry Tour 9630 ups the ante on global connectivity for both groups. It supports the most advanced mobile broadband technologies in the world (CDMA EV-DO Revision A and GSM HSPA, for those of you keeping score at home), and enables e-mail capability in more than 200 countries. Perhaps most important, it has all the makings of a business-class smartphone: It opens PDFs, runs CRM software, has time and expense trackers and all the other business-savvy functions downloadable from BlackBerry App World. Apple's iPhone has entire ad campaigns devoted to convincing users that it can hold its own in the business world. With the BlackBerry Tour 9630, that's a foregone conclusion--in any language.